Who are you and what do you do at Chasing Carrots? 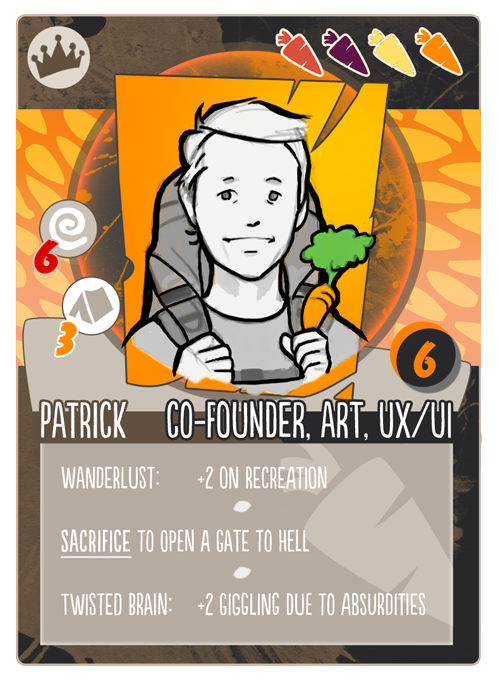 Hi there, my name is Patrick(1), one of the co-founders here at chasing carrots. My background is in 3d animation and filmmaking which i studied at the filmakademie badenwürttemberg before working for a media production company. There I met Dominik and together we (re-)discovered our passion for creating games. At chasing carrots my main responsibility is art, ui and having weird ideas. How and why did you become a game developer? For me, it’s all about creating worlds. I love to envision worlds, characters and contraptions with which players can interact. It was a really strange U.F.O. game on an atari 2600 which kept me playing for days and days.I don’t remember the title, neither what even the goal of the game was. I think what intrigued me the most, was the pure experience of feedback from input controller to screen. Then the era of Commodores began: A C64 and an Amiga500 at friends house…with dozens and dozens of “backup copies” of truly amazing games. Gaming heaven with loading times from hell provided by the lovely “Datasette”. Finally, starting with a 286dx, i joined the (at this moment not so) glorious “pc master-race”. My very first own rig pc was a blazingly fast 486 with 33Mhz on which learned 3d and coding in turbo pascal. What are your all-time favorite games? Diablo. All of them! I love the dense, atmospheric settings and these shiny layers of polish Blizzard packs on all their games. Oh, and: LOOT! Who or what is your favorite band/music? Music is essential to me. Metal, Alternative, Indie, Blues, Progressive Rock. I listen to everything that sparks any kind of emotions…or opens up a mosh pit. If you could be a game character, you would be…?